As Exit reported in March, the government is preparing a special law to avoid the legally mandated tender and privatization procedures, and directly write the determine the recipient of public land by law. Prime Minister Edi Rama announced the law on March 12, during a speech in which he unveiled the plans of Danish architecture company Bjarke Ingels Group (BIG) to design the new National Theater, which will be flanked by a multifunctional shopping complex taking up most of the land that will be privatized. The plan was widely criticized for its senseless destruction of cultural heritage and a corrupt and illegal transfer of public property into the hands of an oligarch close to the government. Architecture firm BIG announced itself “winner” of an architecture competition, which, however, was never made public. The Danish company refused to answer any of Exit’s questions regarding the competition process, hiding behind a non-disclosure agreement. At the same time, several spokespersons of the Municipality of Tirana that Exit was referred to by BIG have refused to respond to any questions. The strategy followed by the Rama government is as clear as it is abusive. Public land owned by the Municipality of Tirana will be expropriated in a direct negotiation with a single, predetermined private company, Fusha shpk. Fusha will therefore not have to compete in a public procurement procedure, or even go through the moves of proposing a public–private partnership. 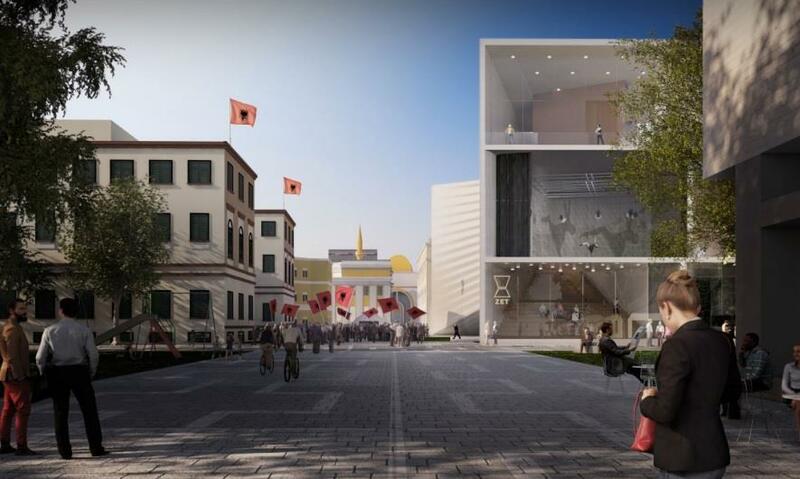 In turn, Fusha will hire BIG for the design of the new National Theater (Rama owes them because they could never build the Tirana Mosque), again without public procurement because Fusha is a private company. A similar construction was used with the construction of the National Arena, where both construction company Albstar and architect Marco Casamonti were contracted without any tender procedure, even though the site is technically public property. The difference with National Arena is that the government now has made an ad-hoc law to justify its actions. It cannot be stressed enough what danger this new development poses to the rule of law in Albania. Laws are made to facilitate the general functioning of the state and justice system. They are supposed to apply to a broad range of cases, to prevent the perversion of the rule of law into a particularist system that serves the interest of only a few or even single individuals or companies. With this new draft law, the government has precisely crossed that threshold: it has written a specific company, Fusha shpk, into Albanian legislation. And it is almost certain that this law will be passed in Parliament, where Rama conducts an absolute majority. Art. 5(1). The contract negotiation commission evaluates and negotiates with the private partner Fusha shpk the proposal presented by them and drafts the final draft contract negotiated by the parties […] within a deadline of 30 days after the establishment of the commission. Art. 7(1) The contract between the Albanian State and the private partner reflects the terms of reference of the proposal presented by Fusha shpk according to this law, which have been evaluated by the Negotiating Commission and are an inseparable part of that contract. It should also be noted that the special law removes the legal competency of the Municipal Council of Tirana to approve or reject the expropriation of the public land it owns. The reason is obvious: the Socialist Party has no majority in the Council. According to art. 8, it will be the Council of Ministers that will officially approve the final contract. This law sets an enormously dangerous precedent that ought to be criticized by EU and international institutions as a serious threat to the rule of law in Albania. What if the Rama government writes a special law giving the seaside Samir Mane? What if it writes a law to stop the investigation of former Minister of Interior Saimir Tahiri? With the introduction of this “special” draft law these scenarios have become no longer unthinkable. Because why bother with the rule of law, when you can write a new one, easily approved by the absolute majority you command in Parliament? With the Constitutional Court paralyzed and unable to scrutinize the constitutionality of this new draft law concerning the National Theater, Rama’s legislative initiative poses yet another, dangerous step into the direction of a full-blown autocracy.